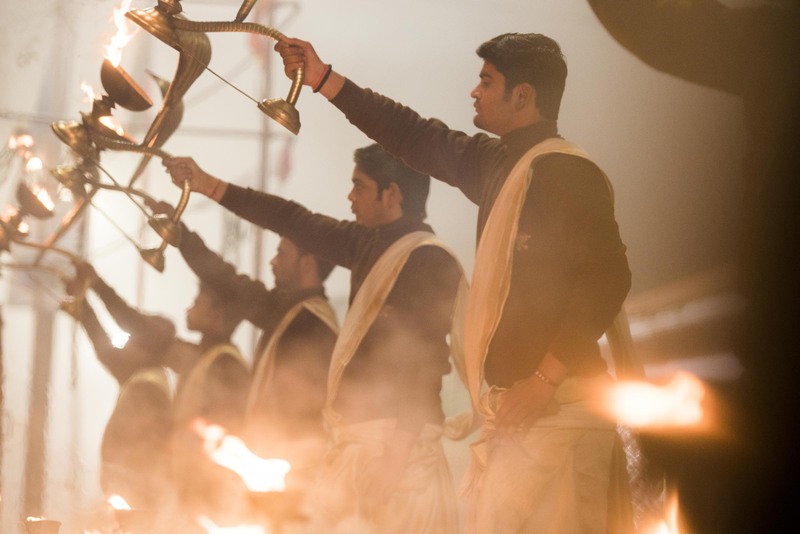 As Uttar Pradesh’s second city, Varanasi conducts a vibrant cacophony of human activity. All aspects of life take place here, publically and relentlessly. Children enjoy the simple joy of flying kites from the rooftops whilst, down below, men and women of all ages carry out the daily routine of washing and prayer, on the banks of the river. Chanting funeral processions charge the narrow alleyways competing for space between the cows and motorbikes, en route to the burning ghats. I spoke to a number of people before leaving for India and those with previous experience seemed impressed (aghast?) that I’d chosen Varanasi as the first destination of my trip. 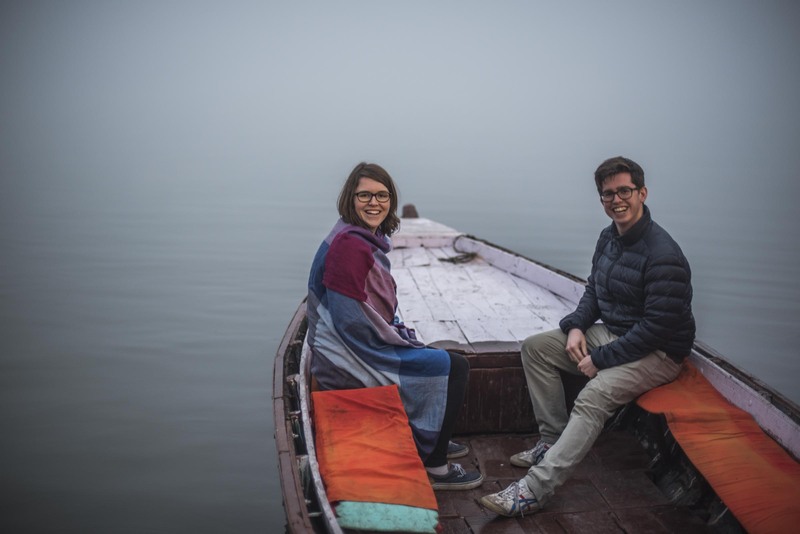 For the India-novice it might be worth considering finding your feet elsewhere, but as I’d grown to accept the craziness and unpredictability of this beautiful country in a previous visit, I threw caution to the wind and dived right in. We did play a few safe cards such as booking one of Lonely Planet’s accommodation recommendations, Ganpati Guest House, and arranging a pick up from the airport on arrival, via them. A little on the pricier side (we’ve since learnt that there were cheaper options of a similar standard) but absolutely what we needed – hot shower, in house rooftop restaurant, lots of advice on guided tours and onward transport, plus free Wi-Fi. 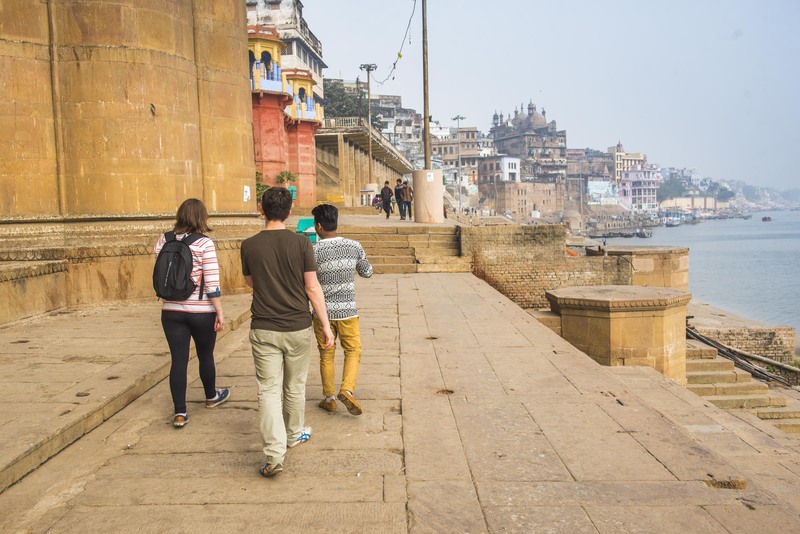 On the first morning we set off with charismatic Raju on a walking tour of various temples and the famous Varanasi ghats (river banks) by the edge of the Ganges. The temples were modest and often well hidden but Raju gracefully helped us navigate the labyrinth of narrow streets and told stories along the way. The Mother Temple collects expensive saris, donated in exchange for good karma, and redistributes them to the poor. We saw the Nepali Temple decorated with elaborately engraved wooden panels – including scenes from the Karma Sutra – that are replaced every 30-50 years. Here we were invited to whisper prayers into the ear of a stone cow facing into the centre of the small temple, with the assurance that this cow would pass our messages on to Shiva. Next door we visited the teacher’s house where a student of a particular caste can spend six years learning to be a priest of high esteem. Raju was of this caste but didn’t like the necessary hairstyle nor did he want to forego girlfriends so he was opting to study tourism, instead. During the tour there were of course the obligatory demonstrations of medicinal oils and exquisite fabrics. Having just arrived in the country with bulging backpacks we politely (and awkwardly) declined their kind offer of buying anything and distracted Raju with our need to visit a cash machine. India has just undergone demonetisation that has had the positive affect of unearthing black market money, but caused nation wide chaos for anyone requiring cash. At the time of writing, the maximum you can get from an ATM is 4500 rupees, but as R500 notes are scarce you can realistically only get R4000 (£50) at a time. For our budget of about £20 a day this wasn’t too much of a problem, but finding a machine that actually had any cash in it was a lot of fun and it’s an activity that needs to be repeated every two, to three, days. On the 14th January the skies of the city become a blur of colour orchestrated by rooftops full of masterfully dextrous kids. Whilst our visit was a little early for the festival itself there were plenty of people practicing, so we thought it would be fun to get involved. Having bought a kite for the extravagant sum of R25 (about 30p), named it Marcus after the festival Makar Sankranti (read it out loud) we got down to the ghats too late to fly it. A friendly man showed us how to string it and many others told us it was a King kite because of the yellow crown shape decorating the front. Sadly Marcus never made it to the skies because we left him in the tuk tuk we took took to the train station. 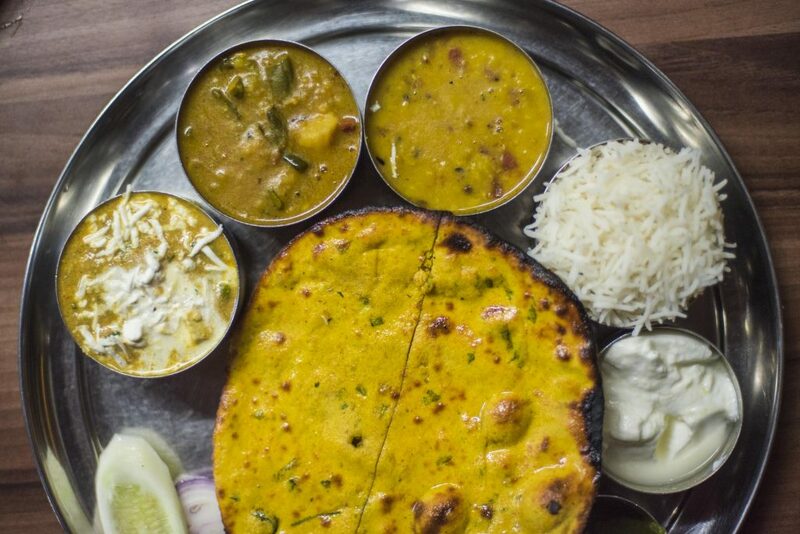 India is full of culinary delights and so on the first night we tucked into Thali, a selection of dishes including curry, dhal, rice and condiments, served with roti. This was a staple favourite over the following days but we also dined out on paneer butter masala, dosa, uttapam and a mysterious but delicious bright green spinach curry dish. Beingterribly English we required tea at least twice a day and enjoyed masala chai by the bucket load. I barely slept during the first few nights of the trip so perhaps some restraint is advisable. After one such sleepless night we took a boat down to see the Morning Ceremony. Both morning and evening prayer sessions are a big part of life here, and worth experiencing whilst in Varanasi. In early January it was a cold, foggy and subsequently damp trip down the river at 5AM and the routine of the prayer was disappointingly similar, yet less vibrant than the better-attended spectacle from the night before. However floating through thick mist in the hushed hours of morning made the river eerie and beautiful, and the trip worthwhile. Before the end of our boat tour we rowed back up river to see the Burning Ghats. It’s a strange thing to be faced with when sleep deprived and damp to the bone but the public ritual of washing, re-clothing and burning of deceased family members made me consider how sterile our approach to death is in the UK. There is intimacy and care in the acts that follow death here in India whilst we are excused these responsibilities and instead hospitals, undertakers and crematoriums handle the necessary procedure. Later that same day we visited the Burning Ghats by foot and saw the funerals up close. I didn’t know how I would feel seeing dead bodies burning on small fires, and I’m still not sure how to describe the experience. Yes, it was harrowing. 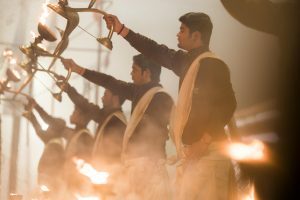 However by understanding the details and cultural importance of the process I was able to digest what I saw and glimpse the beauty and peace the rituals provide. Not for the faint-hearted, Varanasi is a frenetic, fantastic and fascinating city that I thoroughly enjoyed and would highly recommend. 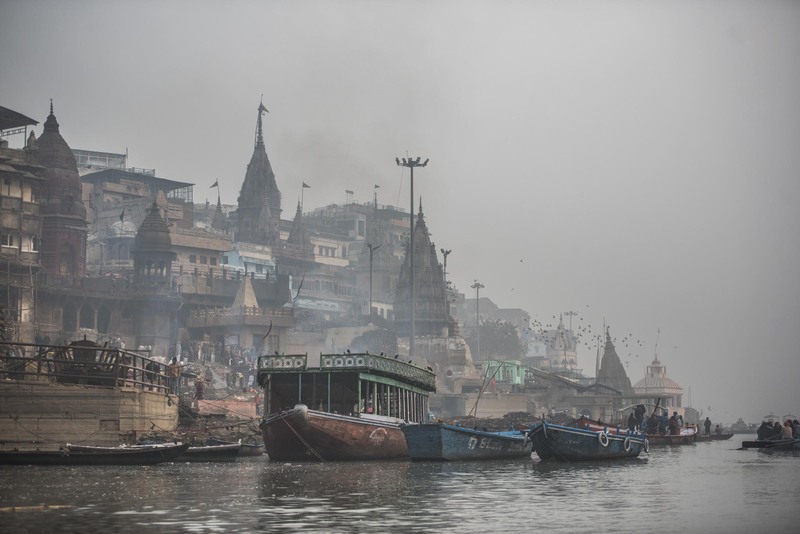 You can learn more about my Varanasi Adventure on YouTube. Thanks to Matthew Williams-Ellis for the incredible photography. ← Running Away to the Circus – Let Nomadic Life Begin! Wonderful post thank you for sharing. Copyright © 2019 Vicky Hunter.